The Colorado lease termination letter, also known as ‘form JDF 97’, is a form that is used to terminate a month-to-month rental agreement. In accordance with State law, the landlord will be required to certain notice before the tenant will be required to move-out. This is dependent on how long the month to month relationship has been in effect. Tenancy for 1-year or longer: 91 days. Tenancy of 6 months to less than 1-year: 28 days. Tenancy of 1-month to less than 6-months: seven days. Tenancy of 1-week to less than 1-month: 3 days. Tenancy for less than 1-week: 1 day. Note: If you are a landlord, only fill out the top portion of this notice (Steps 1-4). If you are a tenant, only fill out the bottom portion (Steps 5-7). Step 1 – The first line of this letter must directly address the person that must be notified of the desire to quit. Enter the full name of the recipient in the first available space. If this is from a Landlord to a group of tenants check the box next to it labeled “Any and all other occupants.” Then enter the date and time the agreement should be considered terminated. Step 2 – Enter the street address, city, county, subdivision (if applicable), lot (if applicable), and block (if applicable) of the premises being referred to. 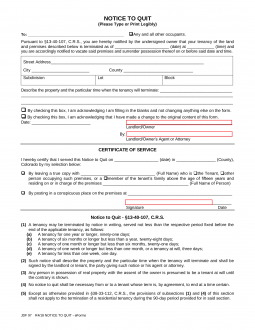 Step 4 – Date and sign the notice. The agent delivering this document should ideally provide a signature as well. Step 5 – If this notice is being written by a tenant and issued to a Landlord/Agent, enter the notice date and the county of the premises on the first line under Certificate of Service. Step 6 – There will be two check mark options. Check the box that will apply to your situation and fill in the necessary information. The first will attest the notice is being given to a specific individual. The full name of the person the notice is delivered to must be entered here (note: if given, make sure it is to an individual who is authorized to receive it or has been named to receive such letters). The second check box will indicate the notice has been posted somewhere easily seen. The address and location of where the posted notice is should be entered. Step 7. Sign the notice.